GL1100 found and I am having a blast with it!! Hello all! I haven't been on this site since 2013. I had to sell my gl1000 then. 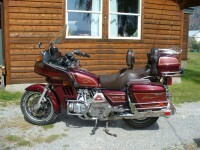 Now, I just acquired a 1980 goldwing in pieces. Long story short I got it put back together and now it is running. Not the best but hey it runs!!! This will be my fourth wing and couldn't be happier. My main issue now is that it seems I cant get the fuel pump to pump gas until the bike is running. I have to dump gas in the carb and then it will start and run. Any suggestions? Thanks for having me as a member and keep up the great work!!!!! Re: GL1100 found and I am having a blast with it!! New fuel pump. I have a '83 Aspy and I just replaced mine. 35 years+ and the diaphragms don't last forever. Glad to hear you got her running. I really like the "OldWings". They have a character to them that just can't be matched. ALL bikes are great, some just stick out more than others. I just got my bike on the road yesterday, as a matter of fact. Took her for a test ride / shake down and couldn't be happier. The never-ending torque is arm wrenching. Mine even would keep pulling away from the 1200. Crazy test driver (45 mph zone) did say it had a bit of front tire vibration when he hit 80 but smoothed right out when the needle went all the way past the top. 0.9 mile stop to stop.I couldn't keep up. Butthead never did buy the bike either.